Thanks to its setting on the banks of the Danube in the northeastern foothills of the Alps, the area around Vienna offers an abundance of beautiful scenery to explore, from tall mountain peaks to emerald river valleys. The city's central location makes it a convenient base for day trips by train to visit some of the nearby towns and villages, where you'll find magnificent abbeys, opulent palaces, and historic attractions. For a longer rail journey, take the Semmering Railway through picturesque countryside or even travel as far as the beautiful Austrian city of Salzburg. If you're prepared to travel even farther afield, you can add a few cross-border cities to your itinerary, such as Prague and Budapest. From the beautiful Vienna Woods to mountain peaks and from lovely old palaces to exciting day trips by boat, rail, and road, the city offers some of the best scenery in Austria right on its doorstep. Stretching for about 40 kilometers between the towns of Melk and Krems, about an hour's drive from Vienna, the beautiful Wachau Valley is a World Heritage Site due to its spectacular scenery and rich history and culture. The Danube River snakes through the valley, past picturesque monasteries, grand castles, villages, and vine-draped hills, conjuring a scene from medieval times. The area is also a hotspot for foodies and is one of the most popular places to visit near Vienna. One of the valley's top attractions is the magnificent Benedictine Melk Abbey, perched high on a hilltop overlooking the Danube River. Highlights include its octagonal domed entrance gate; the Imperial Corridor, lined with priceless art; the museum; the frescoed Marble Hall; and the lovely gardens. The Abbey Church, with its symmetrical twin towers and impressive 18th-century ceiling paintings, is known as one of the finest Baroque churches north of the Alps. An easy way to explore the Wachau Valley, without the stress of driving and possibly missing the highlights, is the Melk Abbey and Danube Valley Day Trip. This full-day excursion begins with an air-conditioned coach ride through the beautiful Wachau Valley, while an experienced guide shares information about the history and attractions in the area, and it continues with a stop at the medieval castle ruins of Burgruine Dürnstein. The tour's finale is a relaxing cruise down the Danube River (in season) to Melk, where you can explore the magnificent Benedictine Melk Abbey. This tour includes pickup from select hotels, the boat ride (in season) or lunch, and entry to the abbey. About 240 kilometers from Vienna, Budapest is affectionately known as the "Paris of the East." It sits in a beautiful location astride the Danube River and is one of the most picturesque cities in all of Europe. Although this is a long day trip, it's worth it for the wealth of UNESCO World Heritage Sites, breathtaking architecture spanning styles from Baroque to Neoclassical and Art Nouveau, and the chance to soak in the city's famous therapeutic springs. Top attractions here include World Heritage-listed Castle Hill, home to the 18th-century Buda Castle; the late-19th-century Fisherman's Bastion and Matthias Church; the magnificent Parliament buildings; Heroes' Square; and City Woodland Park, home to an impressive line-up of museums, as well as the stunning Vajdahunyad Castle. You could spend days here exploring all the cultural jewels. An easy way to visit the city from Vienna without having to relocate is on the Budapest Day Trip, which takes you to many of the city's most famous landmarks. Vajdahunyad Castle, the Parliament Buildings, Heroes' Square, and the Opera House are just some of the highlights. This full-day tour includes pickup from select hotels, a scenic drive through the Hungarian countryside, and a city tour on an air-conditioned coach. About 2.5 hours by train from Vienna, Salzburg is another of Europe's beauty queens. Beset with elegant buildings and surrounded by mountains, this picturesque city straddles the River Salzach and is famous as the birthplace of Mozart as well as the setting for the film The Sound of Music. Highlights of the city include the World Heritage-listed Old Town, with its beautiful Baroque architecture and the Salzburg Cathedral; Hohensalzburg Castle; Mozart's Birthplace, one of the world's most popular museums; and the gorgeous Mirabell Palace and gardens, where the Von Trapp children famously frolicked. A great place to begin a walking tour of the city is from the Residenzplatz, one of the city's largest squares and home to the Residenzbrunnen, an impressive marble fountain by Italian sculptor Tommaso di Garone. If you are not up for doing this excursion on your own, try the Salzburg Day Trip. This full-day adventure includes plenty of photo opportunities on the spectacular drive through the Austrian Alps, stopping at Lake Mondsee along the way, as well as a walking tour through the Old Town and a visit to the medieval Hohensalzburg Castle, one of the largest in Europe. Bristling with spires and breathtaking architecture, Prague has a beautifully preserved old town that is now a UNESCO World Heritage Site. It's about 290 kilometers from Vienna, a long day trip, but you can make it there and back in a day, and get a great feel for the city. The Old Town Square is a wonderful place to begin a walking tour. From here, you can visit many evocative old churches, including the famous Týn Church, and the Jewish Quarter. Other top things to do include visiting Prague Castle, with St. Vitus Basilica, St. George's Basilica, and the Old Royal Palace; and exploring Wenceslas Square in Prague's New Town, which is also home to the National Museum, as well as fantastic shopping and restaurants. Also save time for a stroll across the famous Charles Bridge and try to see a performance at the National Theatre. To squeeze in as much as possible on a visit here, consider the Prague Day Trip from Vienna. This well-planned 14-hour tour takes you through the pretty Moravia countryside to Prague for a 2.5-hour guided city tour to see sights such as Charles Bridge, the Old Town Square, Wenceslas Square, and the National Theatre. Less than an hour from Vienna by train, Slovakia's capital, Bratislava, is an affordable, fun, and easy day out. Old abuts new in this vibrant city, where 18th-century buildings line the streets of the old town and Soviet era architecture sits not far beyond. The Danube slices through the city, and Bratislava Castle is the focal point, perched on a plateau above the river, with its stark white walls and red-tile roof. Start your tour in the pedestrian-only 18th-century old town, where you'll find the old town hall, home to Bratislava City Museum, and Michael's Gate from the original medieval fortifications, as well as many restaurants and sidewalk cafes. Another top attraction is Grassalkovich Palace, where the president of Slovakia resides, and if you feel like getting back to nature, hiking trails lace the surrounding Little Carpathian mountains, close to the city. A fun way to travel from Vienna to Bratislava and explore the city without the stress of navigating your way around is the Bratislava Day Trip tour. This full-day excursion includes a comfortable coach trip to the capital, a walking tour of the old town and all its attractions, and a visit to the Rococo-style Grassalkovich Palace. You can upgrade to include a high-speed catamaran trip down the Danube on the return journey, through the Danube wetlands and the Donau-Auen National Park. At the edge of the Vienna Woods on the city's northern outskirts, the Augustinian abbey in the small town of Klosterneuburg attracts many visitors. Perched high above the Danube, Klosterneuburg Abbey (Stiftes Klosterneuburg) was founded in the 12th century, and many newer buildings were added in the 18th and 19th centuries. Highlights of this sprawling complex are the church, with its Romanesque and Baroque features, the Leopold Courtyard, and the monastery vaults. The famous Verduner Altar in the Leopold Chapel is especially noteworthy and consists of 45 enameled panels dating from 1181. The newer Baroque building has two copper domes, one surmounted by the German Imperial Crown, the other by the Lower Austrian Archducal Bonnet. Other notable features include the Baroque main staircase; the Marble Hall, with its fine frescoes; the Imperial Apartment; the Tapestry Room; the Treasury; and the Monastery Museum. Also of interest is the nearby town of Kierling, with its Kafka Memorial set up in the very room of the sanatorium where the famed writer spent his last days. Fabled in song and a favorite getaway for the Viennese, the Vienna Woods also hold a number of interesting attractions for tourists, including a beautiful monastery, historic sites, and natural wonders. A good place to begin is atop the 484-meter Kahlenberg, Vienna's own "mini-mountain," with magnificent views across the city and the Danube all the way to the Little Carpathians and the Schneeberg region. The Baroque Kahlenberg Church (St. Josef auf dem Kahlenberg) was built on the spot where Polish Prince Sobieski beat the Turkish army besieging Vienna. The Cistercian Abbey of Heiligenkreuz, constructed in 1133, is the oldest continuously occupied Cistercian monastery in the world and one of the most beautiful medieval monasteries. Its highlights include the vaulted Romanesque nave (1187); the 13th-century ribbed vaulting; and the 13th-century choir, considered a masterpiece of Austrian Gothic. Also in the Vienna Woods is Mayerling, the former imperial hunting lodge where in 1889 the only son of Emperor Franz Joseph and the Empress Elizabeth, Crown Prince Rudolph, was found dead with his mistress Baroness Vetsera, an event that rocked the imperial court. The largest underground lake in Europe, the Seegrotte was formed when a former gypsum mine was flooded, and you can take a boat ride through its subterranean caverns and passages. A good way to combine many of these sights is on the Vienna Woods and Mayerling Half Day Trip, which includes guided visits to the Abbey of Heiligenkreuz and Mayerling, a boat ride on the Seegrotte and a scenic ride through the Vienna Woods, past the fairy-tale Liechtenstein Castle. Fields, meadows, vines, and woodland are the distinctive features of the pretty March-Donauland region to the east of Vienna. It was here that many famous battles were fought, including one against the Romans and, centuries later, against the Hungarians, the Turks, and the French under Napoleon. The region was perhaps most important to the Roman Empire, as witnessed in the spectacular ruins of the fortified town they built here, once home to a population of more than 50,000. Now part of a superb historic attraction, Archaeological Park Carnuntum is a reconstruction of the key buildings from the 1st-century town, including a city mansion, a citizen's house, and Roman baths, as well as a semi-reconstructed practice arena of a gladiator school that was discovered in 2011. The park offers fun events and programs for the whole family. The Lainzer Wildlife Park (Lainzer Tiergarten) occupies 24 square kilometers of the Vienna Woods. Famous as a place of relaxation and escape from the big city, it's a haven for old oak and beech trees (some more than 350 years old), as well as wildlife such as deer and boar. Once the hunting reserve of Emperor Joseph II, it was fenced off with a 24-kilometer-long stonewall in 1787 on the orders of Empress Maria Theresa. Opened to the public in 1921, this important conservation area includes more than 80 kilometers of footpaths and the 14-meter-high Hubertuswarte observation tower on the Kaltbründlberg. Another tourist attraction on the edge of the Vienna Woods is Baden bei Wien, a spa town famous for its curative waters (the Romans called the town Aquae). Today, nearly 2,000 years later, the town's sulfur springs still spew out six-and-a-half million liters of therapeutic warm water every day. Just 17 kilometers northeast of Vienna, the pretty little village of Grinzing was first mentioned in 1114. Destroyed numerous times by war, the current structures in the village date predominantly from the 19th century, and its wooded setting, quaint gardens, and winding streets, make it a fun place to explore. Grinzing is also unique in that local laws allow individuals to purchase tiny plots of land where vines may be grown. It's also well known for its many typical Austrian restaurants (Heuriger), famous for indicating whether they're open by placing branches of spruce over their entrances. The area is also popular among hikers, especially for the trails around the nearby Kahlenberg and Leopoldsberg hills. Famous as the birthplace of composer Joseph Haydn in 1732, a trip to Rohrau - just 46 kilometers east of Vienna - is a pleasant way to spend a day. A museum dedicated to the great composer is now housed in the small thatched farmhouse where he was born and boasts numerous fascinating exhibits and artifacts relating to his life. Also open is the actual room in which he was born, refurbished as it would have been at the time. Another highlight of a visit to Rohrau is the castle that once belonged to Count von Harrach. This splendid attraction is now a fine arts museum possessing the Count's vast collection of paintings - all told, more than 200 paintings are held here, including works by Rubens and Van Dyck. A trip along the Danube by boat, through the Danube Valley, offers you the chance to see some of the most beautiful scenery around Vienna. Destinations include cities such as Budapest and Bratislava (up to four days round trip), or simply a short one or two-hour jaunt. In the other direction (upstream) the Danube leads to the Wachau Valley or to Melk with its famous abbey. A variety of fun themed cruises are also available, from fine dining to classic ballroom dancing in the evenings. Alternatively, visitors can hire a boat taxi to explore Vienna from the water. About an hour south of Vienna, picturesque Eisenstadt is famous for its connection to one of Austria's greatest composers, Joseph Haydn. Haydn lived here for many years, and today, his house serves as a museum celebrating his life and times (he was buried in the Bergkirche above the town). 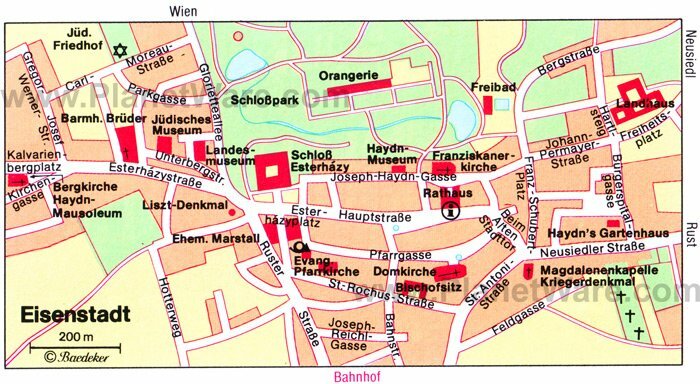 Be sure to explore the lovely Old Town, also known as Freistadt (Free Town), traversed by three long streets opening off the main square - Hauptstrasse, Pfarrgasse, and Haydngasse. It's here you'll find the 17th-century Town Hall (Rathaus). Afterwards, head to Schloss Esterházy, the former palace of the Princes Esterházy. Originally a medieval stronghold, it was rebuilt in Baroque style in 1672, with its stunning rear façade remodeled in Neoclassical style between 1797-1805. Highlights of a visit include the exquisite Haydn Room, with its colorful frescoes and busts (English language guided tours are available). Laa an der Thaya lies about 68 kilometers north of Vienna on the Czech frontier. Highlights of a visit include the remains of the town's medieval walls and the massive moated 13th-century castle - Laa Castle - with its well-preserved battlements and towers and fine panoramic views. Be sure to visit the Old Town Hall (Altes Rathaus), home of the Südmährermuseum Thayaland, an informative local history museum with displays of artifacts and traditional clothing. Other notable highlights include the 13th-century Gothic parish church of St. Vitus, with its High Altar dating from 1740, and the Plague and Trinity columns from 1680.